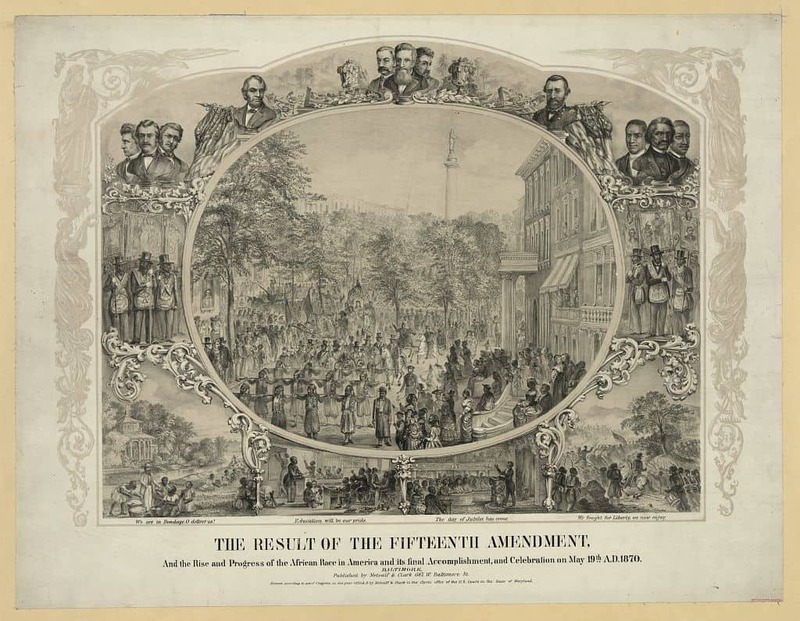 A slightly altered version of another print by the same title (located in image collection) also issued by Metcalf and Clark, commemorating the enactment of the Fifteenth Amendment and its celebration in Baltimore. In the center is a redrawn view of the parade on Monument Street. While it still features a small troop of black Zouaves, it highlights the spectators dressed in fine clothing standing along a row of fashionable houses. The vignettes surrounding the central scene are also redrawn and placed in a different arrangement, with the plantation and battle scenes appearing in the lower corners. Around the central group of busts (poorly drawn) are various tools and implements, and two urns.